Mayanin Casarez, 58, of Edinburg, during the VA Town Hall Meeting Wednesday on Sept. 6,2017, at Edinburg Conference Center in Edinburg. EDINBURG — Jackson Plant was scared to death when he moved to the Rio Grande Valley a year ago and was told he couldn’t get the pain medication he had gotten for nine years through the Department of Veterans Affairs. “Their only answer was ‘go get insurance,’” he said referring to the VA Texas Valley Coastal Bend Health Care System which covers 20 counties in South Texas. Plant was eventually able to get his pain medication thanks to a clause that allowed him to get it because he had gotten it before. 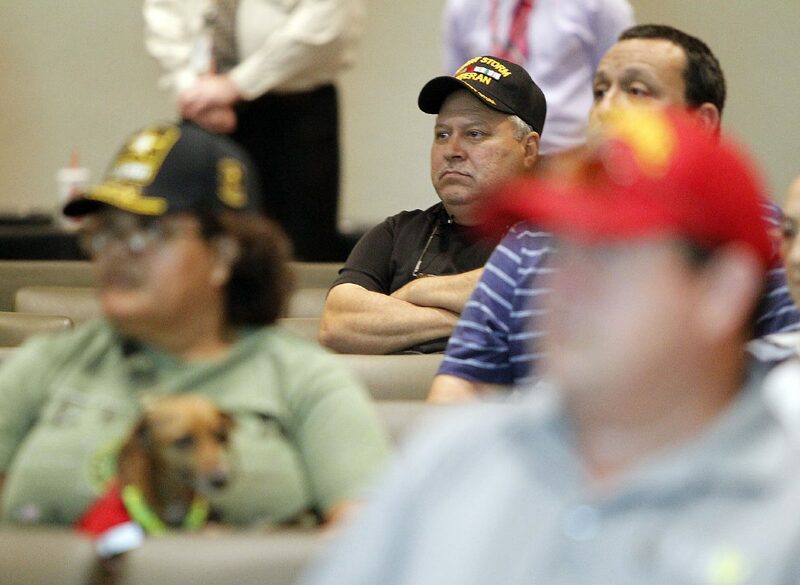 Veterans listen during a VA Town Hall Meeting on Wednesday Sept.06,2017 at Edinburg Conference Center in Edinburg. 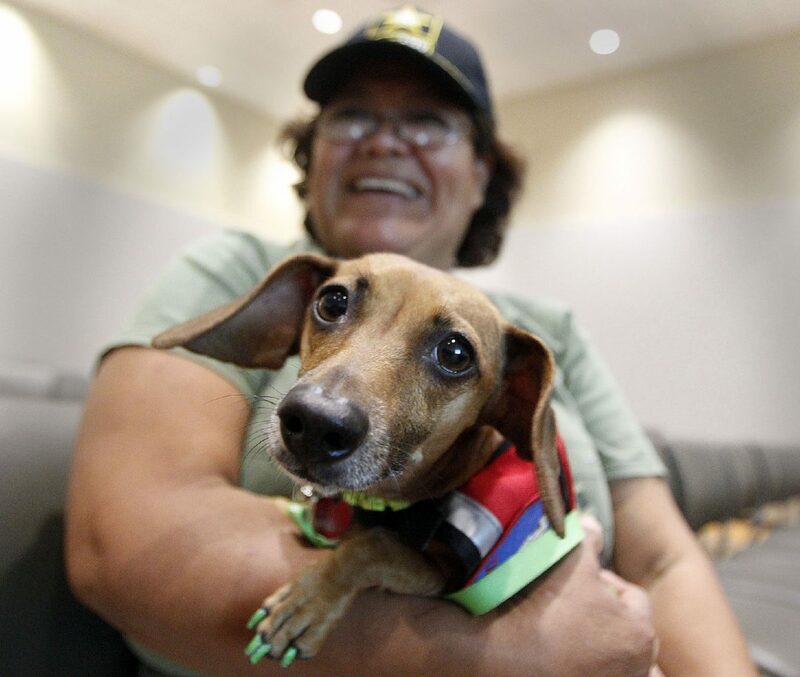 Mayanin Casarez, 58, of Edinburg, holds her service dog, Dora, during the VA Town Hall Meeting on Wednesday Sept. 6, 2017, at the Edinburg Conference Center in Edinburg. 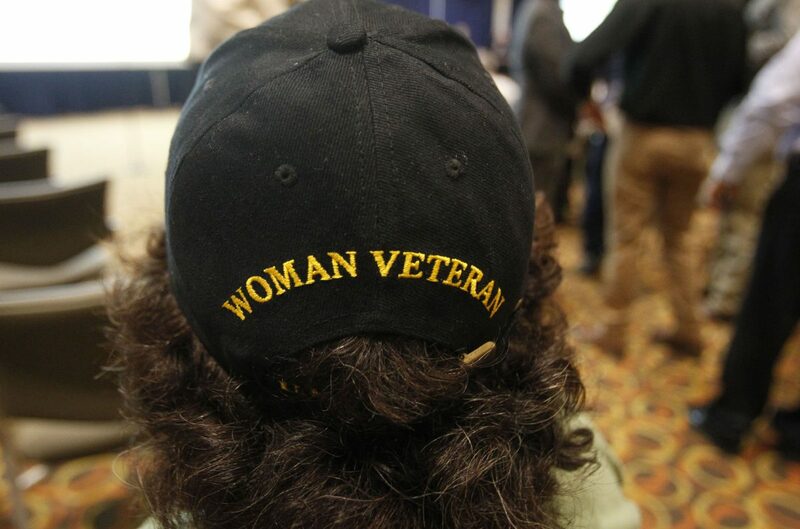 However, at a town hall meeting for veterans on Wednesday, Plant asked why it wasn’t consistent nationwide. The town hall was held by the Valley Coastal Bend to present their goals and allow veterans the opportunity to voice concerns. The ability to track their queries was an important issue for another veteran who said he currently didn’t have a way to know whether issues that he reported had even been looked at by anyone or whether they were resolved. “And also an 800-number, at least, so we can call in and address some concerns,” he said. Perez said that was an issue brought up often and assured it was something they were working on. “We’ve got some new leadership in place that’s really making this move in the right direction,” he said, suggesting that in the meantime they could speak to patient advocates who were available at every clinic. The veteran was also concerned with communication among departments, explaining that the VA didn’t pay for an emergency room visit three years ago because they were unaware that he had sought help at one of their facilities first. “If they had just looked at my medical record or the file they could see that I did go to the facility first before I went to the emergency room,” he said. Perez assured that things were different now with a solid internal process but admitted improvements still needed to be made. “There’s still some work to be done with a lot of the private vendors or private practitioners on where they’re sending the bills and that sort of thing,” he said. Before the question and answer portion, VA officials delivered a presentation on their goals for improving their services, which includes improving the quality of care, modernizing their systems, efficiency and timeliness of service. Michael Walljasper, regional director for the Veterans Benefits Administration, said they were working on an initiative that would allow veterans who did not receive a “desirable discharge” to receive benefits. “What VBA can do is we can look at the facts and circumstances surrounding that discharge and possibly make them honorable for VA purposes, which would entitle them to health care and sometimes entitle them to benefits,” Walljasper said. He explained this would only be for VBA purposes and wouldn’t be an overturn of the discharge given by the U.S. Department of Defense, which they would still have to go through to have a discharge upgraded. Walljasper said he hoped this would help with suicide prevention, which was another major issue brought up at the town hall.